Home page › Ireland › Cork › Beara › Molly's Pet-friendly Seaside Cottage. Free Wi Fi. Contact Michael & Barbara at Molly's Pet-friendly Seaside Cottage. Free Wi Fi. on 353-(0)27-74436 and also 001-973-335-6478 or complete the enquiry form. This charming stone-built seaside cottage enjoys a fantastic location along the stunning and unspoiled Ring of Beara in West Cork, just a stone's throw away from Pallas Pier with its fishing and recreation boats. 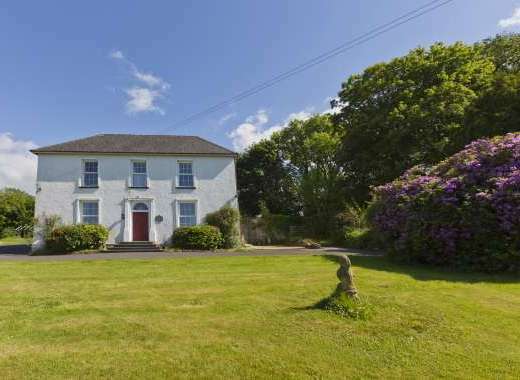 Situated on a shorefront 12 acre farm at Pallas, Ardgroom, Beara, County Cork. Just a short walk away from two small sandy beaches where you can find sea shells and might be lucky enough to spot seals at certain times of year. Only 2 miles to Ardgroom Village for Pub, Restaurant, and Shop/Cafe - with Internet. Castletownbere, our local Town, is 10 miles away. This charming holiday home benefits from free Wifi internet access. Fresh Water and Sea/Rock Fishing, Caves and Hill Walking opportunities are available locally - from a few hundred yards to 3 miles. Golfing, Deep Sea Fishing, Sightseeing Cruises, Dive & Sailing Centers, Water Sports, Horse Riding & Riding School and unique Gardens are in a 6 to 20 mile range. Archaeological sites in Ardgroom and throughout the Peninsula. Additional details on these and other activities are given under 'Local Attractions' below. There are also Brochures and a Booklet in the Cottage that contain additional information about the Cottage, the above and other activities, and on the local area. For more photos and information on a one bedroom Annex adjacent to the Cottage, see our own website. Rated Five Star based on reviews on another popular holiday rentals website. 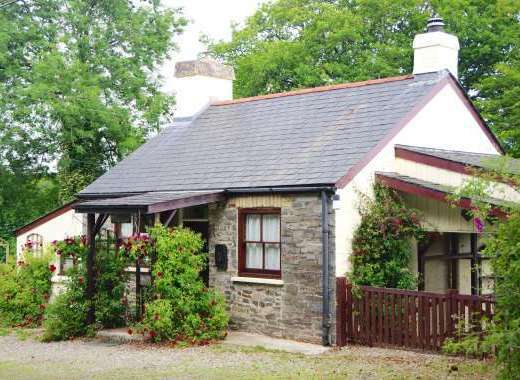 Cottage Address: Molly's Cottage, Pallas, Ardgroom Inward, Beara, Co. Cork. Directions: From Ardgroom Village proceed to Ardgroom Inward for 2 miles and the Cottage is on the right hand side on elevated ground 150 yards past Pallas Pier - also on the right hand side. Cottage is 50 yards back from the public road on elevated ground. GPS Coordinates: 51 Degrees, 45 Minutes, 19.15 Seconds North, 9 Degrees, 52 Minutes, 55.61 Seconds West. Parking: There is private parking space to the left of the Cottage. The cottage has Free Wi-Fi internet access. This Waterfront Cottage has been recently refurbished to offer very good comfortable accommodation for up to six people. There are two open Sleeping Lofts, the main Loft being over the Living Room with twin beds and a bunk bed. The second Loft is over the Sitting Room, and has a double bed. The Sitting Room also has a couch that converts to a bed. The sleeping Lofts are separated by a stone wall. Travel Cot, Child Bed, Child Safety Gate, and Baby Chair available. Radio and CD Player. Open plan Living room/Kitchen. Cooker, Fridge/Freezer, Microwave ,Toaster, Electric Coffee Maker, Electric Kettle, Washer and Dryer. Drying Rack, Wash Line, Iron & Ironing Pad, Hair Dryer available. Bathroom with Shower. The Cottage is centrally heated, and there is an open Fireplace. Also, there is a small one bedroom Annex adjacent to the Cottage with a double bed, an inflatable child bed, a small kitchen, and a small bathroom with shower. The kitchen has a stove, fridge/freezer, sink, coffee maker and electric kettle. The Annex can be rented in conjunction with the Cottage at an additional rent - thus sleeping up to 8 in total. The Annex can also be rented separately. Contact owners for rental rates. (See our website for photos of the Annex). Rental period is Saturday to Saturday in July and August. In other months we may be able to arrange other days. Check-in time is from 3pm to 10pm and check-out time is before 11am, but we may be able to arrange other times. Rent: July-August: 475 to 600 Euro per week. Other months from 290 Euro per week. Booking deposit is 30% of rent. We will hold your reservation for 7 days pending receipt of deposit. Balance of payment is due 6 weeks prior to your stay. Payment is in Euro via bank transfer. Terms and conditions for rental of the Annex are the same as those for rental of the Cottage. When booking, please state number of people, and indicate adults and children. Bed linen and towels are provided. Final cleaning of the Cottage and washing of towels and bed linen are included in the rent. Electricity and Heating Oil are extra based on usage - normally in the 25-40 Euro range per week and payment is at end of stay when the meters are read. We may also have Special Offers at certain times - see this website, or contact owners at the email address or phone number below. See our own website for additional photos of the Cottage and Annex, map, and other additional information. Please visit the owner's website to find out more about the holiday cottage, amenities, surrounding area and places to visit in Cork. 30% deposit, balance due 6 weeks before stay, payment is in Euro via Bank Transfer. Historical Cottage - authentically restored. There is Private parking space to left of Cottage. Type of Cooker: Electric, 4 burner stove with oven and grill. Garden: Open Front Yard/Garden-Overlooking the Sea. Sea Views of Ardgroom Harbour - on the Wild Atlantic Way. A peaceful place to get away from it all. Enjoy watching this guided tour of Molly's Pet-friendly Seaside Cottage. Free Wi Fi..
Local Attractions: Short walk to 2 small sandy Beaches - from which Seals can sometimes be seen (from the Strand in front of the Cottage turn left for several hundred yards, then turn right on to a small peninsula and the Beaches are on the East side). On the way, see Seashells along the Strand and Beaches. A few hundred yards to the scenic Beara Way Walking Trail - on the Wild Atlantic Way. The Trail runs along cliffs that overlook the Shorefront, from which there is a panoramic view of the Kenmare Bay and the Kerry Mountains stretching from the Atlantic Ocean to Kenmare Town. Sea/Rock Fishing, Caves and Hill Walking opportunists are nearby - close to the Beara Way. Fresh Water Fishing in Glenbeg Lake 3 miles away. Recommended Places to Visit: There are many very attractive places both to explore nearby, and to visit on day trips. Castletownbere, our local Town 10 miles away is a picturesque fishing port, and from which there is also leisure deep sea fishing. The Town has a Tourist Office, a bank, supermarket - with fish shop, and many other shops. There is horse riding and a riding school 6 miles away in Urhan, past Eyeries Village. There are unique gardens in two picturesque locations, both by the seaside - one in Lauragh, Co. Kerry, 6 mile away (at Derreen Gardens), and the other in Glengarriff, Co. Cork, 25 miles away (in Garnish Island). 15 miles to the West Cork Sailing & Powerboat Center in Adrigole, Co. Cork. There are canoes and kayaks at this Center as well. In Adrigole there is also a waterfall - at the foot of Hungary Hill. There is another waterfall in Gleninchiquin, Co. Kerry, 16 miles away - off the road to Kenmare. Boat trips, sailing, canoeing/kayaking, and other water sports are at Star Outdoors 18 mile away in Dawros, Co. Kerry, on the Kenmare road (near Kenmare) - overlooking the shorefront is a pub and restaurant at this facility also. Allihies, 15 miles away, has a beach and arts & crafts. At the tip of the Peninsula is historic Dursey Island at 20 miles, and is reachable by Cable Car. Another historic place is Bere Island, which can be reached by Ferry from Castletownbere or via the Ferry form Furious Pier about 3 miles east of the Town. Historic Bantry House & Gardens is 38 miles away in Bantry, Co. Cork. 40 miles to Killarney National Park & Lakes/Muckross House & Gardens in Co. Kerry. Hike or drive along the Wild Atlantic Way. Golf: Golf courses and distances from the Cottage follow: Berehaven Golf Club - 12 miles. Kenmare Golf Club - 22 miles. Ring of Kerry Golf Club - 26 miles. Glengarriff Golf Club - 27miles. Bantry Bay Golf Club - 37 miles. Killarney Golf Course - 40 mile. Annual Events: Each year, in the first week of August there is a Festival in Castletownbere which includes a Regatta, Outdoor Music, Children's Carnival, and other activities. The Eyeries Village Annual Family Festival takes place in mid July. The Annual Allihies Festival is in mid August, and includes Horse Racing, Sports Competitions and Music. In Kenmare, there are also Festivals during July and August. Recommended Places to Eat Out: Molly's Cottage is 2 miles from Ardgroom Village which had a Shop, Post Office, ATM, and Deli/Cafe - with Internet (all in the same premises), a Pub (with internet) and Restaurant (Summer). Eyeries Village, 5 miles away, also has a Restaurant. Kenmare, 22 miles away, has many restaurants and cafes. Castletownbere also has some restaurants, cafes, and several pubs that serve food, including the historic McCarthy's Bar. Some of the pubs also have live music. Also, a Booklet and Brochures in the Cottage have additional information on places to eat.